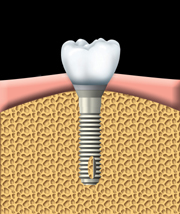 If you are having an implant, your dentist may refer you to a dental specialist who has further training in this area. 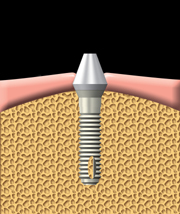 Specialists who place implants are periodontists or oral and maxillofacial surgeons, also called oral surgeons. If you would like more information on replacement of missing teeth please call our office for a no charge consultation with Dr. Appleton. There are a variety of situations that require a tooth to be restored with a dental crown. Excessive wear of teeth: If a person has a habit of grinding their teeth, the teeth will become shorter over time. The teeth can also wear away due to acid erosion caused by gastrointestinal acid reflux (GERD), bulimia, or an acidic diet. Sometimes, the enamel will wear away completely, leaving small, soft teeth. Over time, the bite can collapse and the only way of restoring the teeth to normal size is by covering the teeth with crowns. Undesirable appearance of teeth: Teeth that have an unacceptable appearance due to color, shape, or spaces between teeth can be made to look very natural and beautiful with crowns. 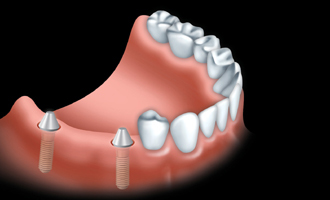 Other: Crowns are placed on dental implants to restore spaces left from missing teeth. Another way of filling these spaces is with dental bridge, which are made from crowns on the teeth next to the spaces attached to fake teeth in the middle. If teeth are loose, crowns can be placed on multiple teeth and splinted together to provide more stability. 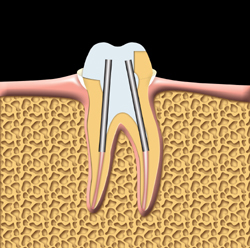 The dental crown procedure first involves numbing the tooth with local anesthesia. If the tooth has been fractured or had a root canal treatment, it will first need to have a buildup — a filling that restores enough of the tooth for the crown to hold onto. Then the tooth is shaved down to make room for the crown, and an impression is made of the prepared tooth with a putty-like substance or a digital scanner. The dentist will then determine the shade of the patient’s teeth using a shade guide or take pictures of the teeth to help the lab technician make crowns that will match the rest of the patient’s teeth. 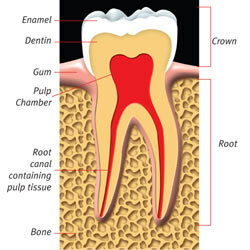 A temporary crown is made from a resin or acrylic material using a molding of the original tooth. 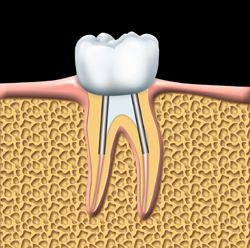 This temporary crown is cemented with temporary cement so that it can come off easily once the permanent crown is ready. Usually a few weeks after a temporary crown, the patient returns for a second visit. During this visit, the tooth may or may not need to be numbed again and the temporary crown is removed. The permanent crown is placed on the tooth and inspected for acceptable fit, bite, and smooth margins. 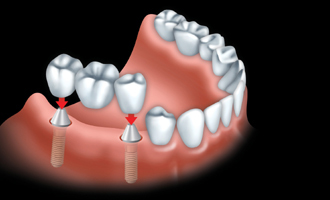 After any necessary adjustments have been performed, the crown is cemented with a permanent cement or dental glue. Please call Dr. Appleton at 905-668-6301 if you would like more information about dental crowns. Call Dr. Appleton at 905-668-6301 for your free Invisalign consultation. Information and video provided by Invisalign. People may overlook the effect stress has on our oral health. However, our mouths can be just as affected by stress as the rest of our bodies are. Stress can have real consequences for our oral health as well as overall well-being. The general effect of stress is that people tend to neglect their oral health-care routines: they may not brush or floss as often as they should or miss dental appointments; they alter their diet by consuming more sugar- and carbohydrate-laden foods; and they drink more coffee and other unhealthy liquids like energy drinks and soda pop. This not only greatly increases the risk of tooth decay, but the additional acid contributes to the erosion of tooth enamel. The signs and symptoms of chronic stress can be subtle, and you may not be aware of its effects until it’s too late. Being able to detect the oral signs of stress means your dentist is the first line of defense against the toll stress can take on your health. Stress can also manifest into various oral health conditions that, if left untreated, can have serious impacts to your overall health and well-being. Here are some of the more common ones. Bruxism, or teeth grinding. People under stress may clench or grind their teeth, especially during sleep, and may not even be aware of it. Over a long period of time, bruxism can wear down tooth surfaces. Teeth can also become painful or loose from severe grinding or prone to fractures. Over a long period of time, bruxism can cause a lot of irreparable damage. Bruxism is also a major cause of disorders that occur in the temporomandibular joints. Depending on the patient, a dentist will recommend an oral appliance or nightguard which may help in reducing the bruxism habit and helps protect the teeth from damage caused by grinding. Temporomandibular disorder (TMD). TMD affects the jaws joints and groups of muscles that let us chew, swallow, speak and yawn. Symptoms include tender or sore jaw muscles, headaches and problems opening or closing your mouth. Bruxism is a major cause of TMD – clenching your jaw muscles can cause them to ache. Periodontal (gum) disease. Research has shown that stress affects our immune systems, increasing our susceptibility to infections, including the bacteria that cause gum disease. At times gingival tissues can show signs of inflammation that could be stress-related as well as increased signs and symptoms of certain oral conditions like lichen planus. Xerostomia (dry mouth). Dry mouth can be caused by stress and can also be a side-effect of medications taken to treat stress and depression. Saliva is vital to keep your mouth moist, wash away food and neutralize the acids that are produced by plaque. Without an adequate flow of saliva, your mouth’s first line of defense against plaque is compromised and this can lead to tooth decay. If dry mouth is left untreated, you can develop tooth decay, gum disease and be at a greater risk for fungal or viral infections in your mouth. To combat the effects of dry mouth, your dentist may recommend that you chew sugarless gum, sip water regularly and use non-alcohol mouthwashes and over-the-counter saliva substitutes. It may be impossible to eliminate all stress from your life, but you can take simple steps to reduce its impact on your health. Find relaxation techniques or exercises to help you cope with stress. Counselling may also help. Brush at least twice a day and floss daily. Schedule and keep regular appointments with your dentist. Your dentist can detect the signs of stress during an examination, and therefore diagnose and treat stress-related oral-health problems before they worsen. Talk to your dentist about getting a custom-fitted nightguard to protect your teeth while you sleep. Eat a balanced diet, with plenty of fruits and vegetables. Drink plenty of water throughout the day to moisten your mouth and stay hydrated. Stay active. If you don’t have time to exercise, a 30-minute walk every day is a good start. If you or a family member suffer from jaw pain and headaches call Dr. Appleton and schedule an appointment. Signs your teeth aren’t as healthy as you think. bleeding gums and bad breath can both be signs of gum disease. if you notice white patches on your teeth or a tooth getting darker over time, consider seeing a dentist as you might have cavities or dental trauma. Everyone wants a healthy smile, but it’s not always easy to tell when your teeth are struggling. Though it’s normal to experience bouts of bad breath once in a while, persistently bad breath might mean something is amiss in your mouth. Bad breath or can be a warning sign of gum disease. Improper brushing and flossing can lead to a buildup of plaque and bacteria on the teeth and gums causing inflammation and bleeding of the gums. Bad breath can also be caused by sinus issues or even stomach problems, so it’s worth a trip to the dentist if you notice your bad breath isn’t going away. A healthy tongue should be light pink. Your tongue can turn many different colors depending on what you’ve recently eaten but if you notice that your tongue usually looks white and coated, your mouth might not be as healthy as you think. Keep bacteria at bay by giving your tongue a quick scrub with your toothbrush or the ribbed back of your brush head. Keeping up with brushing and flossing is also a good way to decrease the harmful bacteria in your mouth. If you find yourself frequently fishing food out of your smile, it might be a symptom of a growing cavity. If you’re flossing and brushing like normal but feel that there’s always food stuck between your teeth, this could be a sign of a hidden cavity between teeth that you can’t see from the surface. If you suspect that food might be catching on a hidden cavity, be sure to bring it up with your dentist so that they can take a look between your teeth. It’s also a good idea to keep up with regular flossing to keep any small cavities from growing larger. Brushing your teeth shouldn’t cause your gums to bleed. If you’ve been noticing a bit of blood in your toothbrush or saliva after brushing or flossing, it could be a sign that your gums are in distress. Inflamed gums bleed upon a light touch, even with a toothbrush. Healthy gums do not bleed upon a light touch. If you see pink in the sink after brushing your teeth may not be as healthy as you think. White patches on your teeth could be one of the first indicators of an impending cavity. White spots could indicate early tooth decay with porosity and weakening of the enamel. Tooth decay is often in areas that you can’t see, like the back of teeth or between teeth, so it’s hard to spot with the naked eye. That’s why scheduling regular dental appointments is so important. Sometimes dental problems can be seen rather than felt. When one tooth starts to look darker than surrounding teeth, it might indicate a nerve problem. If a tooth is struck, often in an athletic trauma, the nerve inside the tooth cannot sustain the blow. This tooth can become necrotic and can darken over the years relative to its neighbor. This condition often occurs in front teeth. If you notice one tooth darkening, you should definitely consult a dentist even if the tooth doesn’t hurt. Not doing so can result in the loss of the tooth. With healthy teeth, you should not experience discomfort when brushing, flossing, or chewing. Pain when biting or eating can indicate you’ve sustained a temporary tooth injury or more serious damage. Sometimes you can have a ‘bruised tooth.’ For example, if you bite into a pebble in a salad unexpectedly, the tooth can become tender for a few days. Like any bruise in your body, this eventually heals. Any tooth pain that does not go away after a week could be a sign of a serious issue, such as a cracked tooth, which might require restorative dentistry. If your teeth hurt for a while after drinking hot liquids, consider seeing a dentist. Sensitivity to hot or cold foods and beverages can be a sign that a cavity is brewing in your teeth. Healthy teeth usually aren’t too sensitive to extreme temperatures, but ailing teeth might hurt or ache after you take a sip of hot tea or enjoy a bowl of ice cream. Often, the length of time the teeth hurt are an indication of how severe the problem may be. Do not be alarmed if it hurts just for a second because sometimes cold drinks tend to trigger a bit of sensitivity for just a brief second. You know you may be having a problem if the sensitivity to cold or hot lasts longer and longer. Please call Dr. Appleton for a complete exam at 905-668-6301.
negatively impact your dental appointment. like tobacco and alcohol).To ensure your safety, your dentist needs to know if you have taken any cannabis prior to your dental appointment. Various strains of cannabis have different amounts of THC. The amount of THC in your system is determined by the strain, the amount and the way it is consumed. When smoked or inhaled as vapour, the effects tend to peak sooner and dissipate more rapidly. When eaten, the drug effect takes longer to appear, lasts longer and is less predictable. to re-schedule your appointment for another time to ensure your safety. Cannabis can impact the effects of medications and anaesthetic needed for your procedure. Using cannabis can increase your risk of bleeding and cause complications for healing after your dental procedure. Three Great Tips to Motivate Your Kids to Brush More! Tip #1 KEEP IT FUN! Brushing and visiting the dentist should be both positive and fun experiences. The worst thing you can do is threaten your child with brushing. Don’t tell your child that if he/she doesn’t brush that they will have to see the dentist as if it’s some big scary punishment for not brushing. You can use music for this purpose. Play your child’s latest favorite song to keep them brushing longer. The goal is to get them brushing for 1-2 minutes ideally, after every meal. We recommend an hourglass for brushing which allows the child to have a concept of how much time is left to brush. An easy and inexpensive way to track the amount of time spent brushing. Brush Hero is a gaming app that you play by brushing. In each two-minute game you earn points by thoroughly brushing all your teeth. Any toothbrush and smartphone can be used with the app. Thank you to one of our patients for recommending it! Dr. Appleton and Dr. Bana recommend to keep brushing fun so your children will develop a healthy and positive attitude towards their dental care. If you would like more information please call the office and one of our team members will answer any questions you may have! Root canal treatment, also referred to as endodontic therapy, is an effective and safe treatment for teeth whose pulp has become inflamed or infected. It can also be required in other situations to help save and restore a tooth. 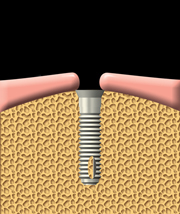 Root canal treatment is routinely performed successfully by dentists across Canada. A dentist who has taken advanced training in endodontic therapy is called an endodontist and may be recommended by your dentist for more complex cases. Root canal treatment remains, for many patients, the only viable option to retain a tooth that has suffered severe damage or has become infected. 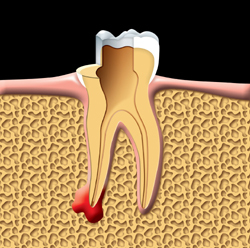 Root canal treatment is the process of removing infected or injured tissue (pulp) from inside the crown and roots of a tooth. Once cleaned, the canal is disinfected, shaped, filled and sealed with natural rubber-like material called gutta percha. 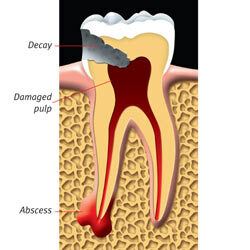 The opening of the tooth is then sealed with either a temporary or permanent filling to prevent future infection. Considerable advancements in diagnosis, radiographic imaging, equipment and techniques now permit dentists and endodontists to complete root canal treatment, even for teeth with very complex anatomies, to the highest level of precision. The Canadian Dental Association (CDA) and the Canadian Academy of Endodontics (CAE) caution that misinformation about root canal treatment is circulating in the public domain. Patients are advised to discuss any questions or concerns about root canal treatment with their dentist and endodontist to ensure that unnecessary anxiety or fear of developing other health problems does not result in treatment delays which could further compromise the integrity of the tooth. Taking proper care of your teeth and gums is a lifelong commitment. The best way to prevent the need for root canal treatment is to follow a good oral hygiene routine by brushing twice a day, flossing once a day, and to visit your dentist regularly. Please visit these trustworthy sources of information which address common misconceptions about root canal treatment. The Canadian Cancer Society: Do Root Canals Cause Cancer? The Canadian Dental Association (CDA) and the Canadian Academy of Endodontics (CAE) are aware that misinformation about root canal treatment is circulating in the public domain. False claims about root canal treatment is harmful because it creates undue fear, or confusion among patients and their families which can lead to delays in seeking treatment and result in the loss of otherwise treatable teeth. The spread of inaccurate information about root canal treatment is not beneficial to patients in terms of their comfort, safety, or long-term health. Since patient safety, quality oral health care, and knowledge about oral health and related procedures are top priorities for CDA, it has worked with the CAE to provide the most current and factual information about root canal treatment and its safety. The CDA is committed to share important information about oral health and will continue to monitor the situation. How is a tooth restored after root canal treatment? 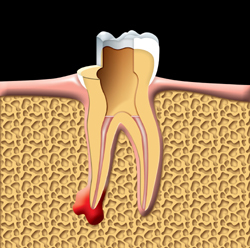 What is root canal surgery? WE WARMLY WELCOME ALL NEW PATIENTS! We are pleased to welcome you as a new patient and look forward to being of service to you. Our office is conveniently located in beautiful downtown Whitby. Free parking is provided behind the building off Kent Street. It is important to us to that your first visit feels comfortable and welcoming! From the moment you walk into our office and are greeted by our experienced and friendly front desk administration team. Lori and Trish will make you feel as though you are part of our extended family. Your dental appointment time will be a special one. Our trained staff will take all the time necessary to discuss your dental health, your needs and goals. We will always try to keep your visit as efficient as possible, ensuring that it starts on time and ends on time. We always welcome your feedback on how we can further improve meeting the needs of our patients. Our goal is to keep you aware of your dental health needs. To accomplish this, we keep in touch with our patients by email, text messages or even a simple phone call whichever is convenient for you. Can cold weather cause teeth sensitivity? Brushing too vigorously: Brushing with too much force can start to wear down your enamel. Clenching and grinding: Some people may clench or grind their teeth in their sleep. Tooth decay: Sensitivity to cold is an early sign of an undetected tooth decay problem. Periodontal disease: Diseases of the gums, cementum, periodontal ligament, and alveolar bone can expose the dentin and cause sensitivity. Tooth whitening agents: Have you started using a new tooth-whitening agent? The ingredients that make your teeth whiter may strip past surface stains and start wearing down your enamel. If the agent starts hurting your teeth, stop the treatment. Acidic beverages: Sensitivity can also be a result of drinking sodas, coffee, tea, and other drinks with a high concentration of acid, such as juices, can erode your teeth and expose the dentin layer. Should you experience any sensitivity during the cold weather call our office at 905-668-6301 for an appointment with Dr. Appleton.